The last reservation of this item will conclude on May 23. For rentals that require shipping or a pickup at a non-headquarter location, please select a later date for your arrival. Headquarter offices are the only locations that can accept a same-day reservation, as transit time is not calculated in this date. 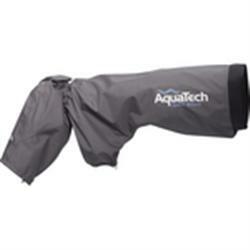 The AquaTech SS-600 Sport Shield Rain Cover is designed for specific telephotos lenses. Please see the notes tab for further details on exact lens compatibility. This shield must also be paired with a waterproof eyepiece for your camera in order to provide complete protection. Eyepieces are available at checkout for an additional $4. If you just want basic lens protection without the complete waterproofing for your camera, you can choose to omit the eyepiece. Please refer to this chart to find the eyepiece you need for your camera. It is made of a 3-ply, waterproof, breathable fabric with fully-taped seams sealed around the view windows. It is made with weatherproof zippers for ease of removal. The rain cover provides a watertight seal around lens front. The one-piece design provides complete enclosure and moisture protection for both the camera body and lens with a "glove-like" fit. It is designed with a waterproof sleeve to access and operate the camera controls safely and easily. This design seals the fabric with a series of coatings or "layers" that prevent driving rain, water, snow or dust from entering the fabric. Please refer to this chart to find the eyepiece you need for your camera. Please refer to the notes tab for details on lens compatibility. • This sports shield rain cover must be paired with a waterproof eyepiece for your camera in order to provide complete protection. Eyepieces are available at checkout for an additional $4. If you just want basic lens protection without the complete waterproofing for your camera, you can choose to omit the eyepiece. Please refer to this chart to find the eyepiece you need for your camera. • These lenses must be equipped with their hoods in order for the sport shield to operate optimally. • If your lens is 23" long and 8" in diameter (or is so with its hood) and not listed above then this shield may still work for you but experiment at your own risk.